We are the Jefferson City Cantorum. Our name comes from the word “cantor” which means singer. We are a community choir that began in 1967 as a group of friends who gathered to sing and socialize and branched out at Christmas to sing carols at a local hospital. Today we average 65-75 members per concert. We sing two major concerts a year. Over 400 people have sung with us since we began. We are doctors, lawyers, teachers, plumbers, teens and retirees. We occasionally have an entire family singing. We’ve sung at the governor’s mansion and on the steps of the capitol, at a grand concert hall in Ireland and a tiny stone church in Rich Fountain, Mo. We’ve sung at weddings and funerals, state dinners and 4th of July celebrations. 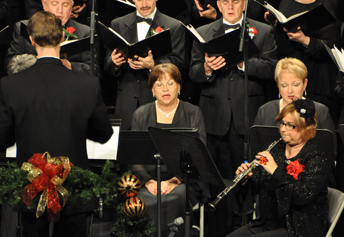 We’ve sung with the Jefferson City Symphony, the St. Louis Symphony and the Kansas City Philharmonic, plus we do mini-concerts at local nursing homes and assisted living centers as well as some of our shows for conventions and large other larger events. We enjoy singing a wide range of music, classic, popular, American music, country, patriotic music and show tunes, to name just a few. What keeps us together is the joy of singing and sharing that joy with the community.